Discover a cool, creamy and refreshing Pineapple & Cream Cheese JELL-O Salad. This Pineapple & Cream Cheese JELL-O Salad is a great option for potlucks. Dissolve JELL-O in 2 cups boiling water. Whisk in softened cream cheese until thoroughly blended. Then add crushed pineapple, pineapple juice and 1/2 cup cold water. Pour into 6-cup mold and refrigerate until set. Turn out mold onto serving plate. Spoon COOL WHIP into center of mold. 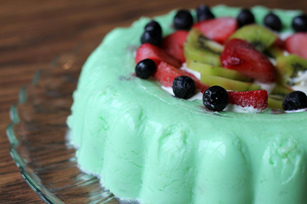 Serve immediately, and be sure to add a big spoonful of the fruit and COOL WHIP to your JELL-O for a cool, creamy and refreshing fruit dessert! This is the perfect dessert for your next party. Since it serves 12, you have enough to feed a crowd.